Chord Electronics officially launches SPM 1050 MKII power amplifier | What Hi-Fi? We first saw the SPM 1050 MKII at the Munich High End Show, but few details were released. Now ready for a worldwide launch, it features aesthetic improvements as well as the latest Chord amp technology. 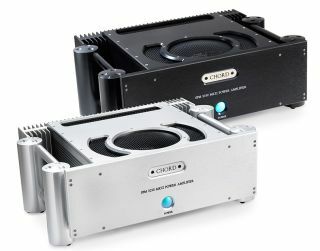 Chord says the MKII model produces less distortion than its predecessor, for “even greater transparency and fidelity”, and has cleaner power delivery thanks to various improvements to capacitance. Other improvements include enhanced isolation on the mains transformer to help reduce interference. The SPM 1050 MKII again uses Chord’s low-distortion amplifier circuitry with four proprietary lateral-structure dual-die MOSFETs per channel, meaning there’s eight in total. Chord says this configuration means the MKII can drive “even the most demanding loudspeaker with clarity and precision”. Connections include balanced XLR and RCA phono inputs alongside two pairs of loudspeaker outputs. A single power button adorns the front and two LEDs show the power and relay functions. The casing has been machined from aircraft-grade aluminium which has sonic benefits such as dampening unwanted vibrations. The SPM 1050MKII also features Chord’s proprietary 2KW high-frequency switch-mode power supply, which can found on all of the company’s amps. The power supply delivers instantaneous power from both power rails simultaneously, which Chord says gives the “perfect balance and dynamic precision for music”. A bank of energy storage capacitors are ‘recharged’ many thousands of times a second by the power supply, which means the amplifier has huge reserves of power to hand allowing it to react “effortlessly to any signal”. We were big fans of the original SPM 1050, awarding it five stars in 2007, so we have high hopes for the MKII version. The Chord Electronics SPM 1050 MKII is available now in black or silver finishes, priced £4950.